Redefine your workspace with the stylish, minimalist conception of this modern LANGRIA desk with storage drawers & compartments. The table is designed using eco-friendly Formaldehyde class E1 MDF board panels with a grain texture that naturally matches most decors. It features 2 white storage drawers with cut-out handles and 2 black-walnut upper compartments, both with desk grommets, one of them with a lid and the other with an anti-fall metal rail. The lid and the rail are detachable and interchangeable. 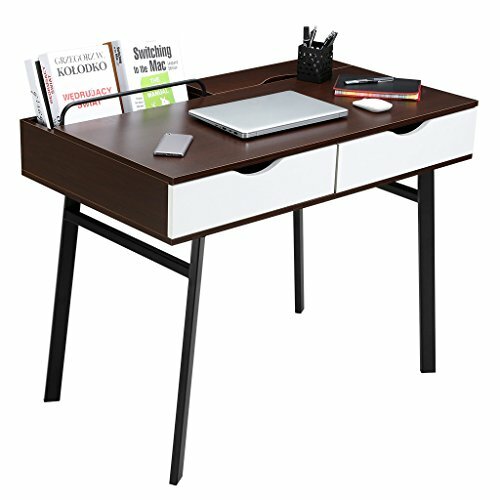 4 solid metal black legs with anti-scratch protectors keep the desk in balance and without scratching the floors. Beyond its minimalist style, the desk counts with a large working area (39 x 23 in) to better carry out with all your activities such as writing, studying, reading and more. The 2 storage drawers, with internal dimensions of 16.5 x 13.5 x 3 inches, are perfect to handily organize your paperwork, notebooks and other office supplies and stationery. Moreover, the table also works great as a hallway console table to put your decorative items and keep objects such as your keys or wallet, or as a chic dressing table where you could add a table stand mirror to do your makeup and keep all your beauty products organised. This desk requires some assembly. 2 adults are recommended for assembly. In order to keep your workstation clean and shiny, dust regularly with a clean dry cloth. If any spill may occur, wipe it up immediately with a damp cloth and dry with a clean cloth.